A soft tissue injury is any injury to a ligament, muscle, or tendon. These “soft” areas of the body typically become injured after undergoing some trauma, such as a car accident, or another type of personal injury accident. Victims hurt in a car accident usually suffer from symptoms of a soft-tissue injury. Car accidents subject your body to an extreme amount of trauma. The rapid change in direction causes your body to absorb all of that force resulting in a reaction known as muscle splinting. Below is an explanation of the most common types of soft tissue injuries people sustain in an accident. Sprains: A sprain occurs when the ligament is stretched or torn. Ligaments are strong bands of connective tissue, and they connect one bone to another bone. Their primary function is stabilizing and supporting the joints in the body. Contusions: Contusions are bruises. These injuries are caused by force, or blow, to the underlying muscle fibers. They crush these fibers and connective tissues without breaking the skin, but it causes discoloration and blood pooling in the affected area. Strains: Strains injure the muscles and tendons in the body. Tendons are made of fibrous cords of tissue, and they attach bones to muscles. Strains are similar to sprains, in that they stretch or tear your tendons or muscles. Strains will cause pain, cramping, swelling, muscle weakness, and spasms. The most common type of ligament strain after a Car Accident is Whiplash. Some accident victims experience these symptoms immediately, while others do not feel any pain or symptoms for several days to weeks after the accident. Soft tissue injuries cause pain, discomfort, soreness, swelling, stiffness, and bruising. Depending on the severity of the crash and the amount of force caused by the collision, passengers in the car can experience severe pain from being violently thrown around within the car. Why See A Chiropractor After A Car Accident in Which You Suffered a Soft Tissue Injury? Because soft tissue injuries can take days or even weeks to develop it is important to see a chiropractor immediately following the accident. A chiropractic doctor can diagnose any injuries you sustained and provide you with a specialized treatment plan. These medical records are also essential if you plan on filing a claim against the at-fault driver. Because soft-tissue injuries do not appear on x-rays, a professional medical diagnosis of your condition is required to get you the compensation you need to recover and pay for your medical treatments. If you are in the Georgia or Tennessee area, our Car Accident Clinics welcome you. 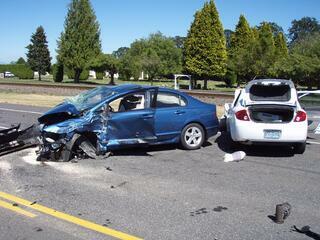 Our team of Accident Injury Chiropractic Doctors has been treating crash victims for over 40 years. If you or a loved one has been injured in a wreck and need to speak with someone about your soft-tissue injuries, click the link below for a Free Consultation!